Like the Lark Bunting discussed in the last article, the Ferruginous Hawk is a bird that also occurs only in the grasslands of North America. In Canada it is found only in the southern grasslands of Alberta and Saskatchewan. For many years the Ferruginous Hawk has been listed as rare, endangered, threatened and so on, but every time that I have traveled the south I have always seen at least several. The Ferruginous Hawk shares the plains with two other similar sized (actually slightly smaller) hawks, the Swainsons and Redtailed. While driving along any road in the grasslands one will almost be assured of seeing one of these three hawks every hundred metres or so sitting prominently on a fence post or power pole. From there they survey their surroundings for prey with their favourite the common gopher (Richardson's Ground Squirrel) supplemented by mice and striped gophers. In addition, the Grasslands National Park now has about ten Prairie Dog colonies that serve as nature's pantry for a variety of predators. Only the pups can realistically be taken by the Ferruginous Hawk, but the much larger Golden Eagles have no trouble dispensing with an adult. 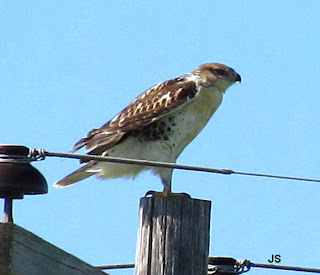 Of the three hawks listed the Ferruginous is the palest with white under parts extending from the chin to the tail tip. Although it is the largest of our hawks the size difference is so small that if all three hawks were lined up side by side they would all appear to be the same size. The undersides of the tails of the Swainsons and Redtailed are barred while those of the Ferruginous are pure white. This difference can be used to differentiate the Ferruginous from the others. 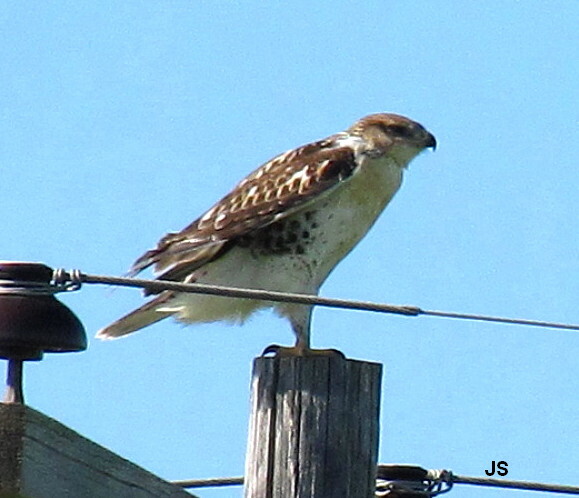 While the females and males are the same the females are noticeably larger than the males which adds to the confusion if one is trying to identify hawks by size. The Western Meadowlark discussed in the last article is a grassland bird that readily adapts to man-made hayfields and pastures. 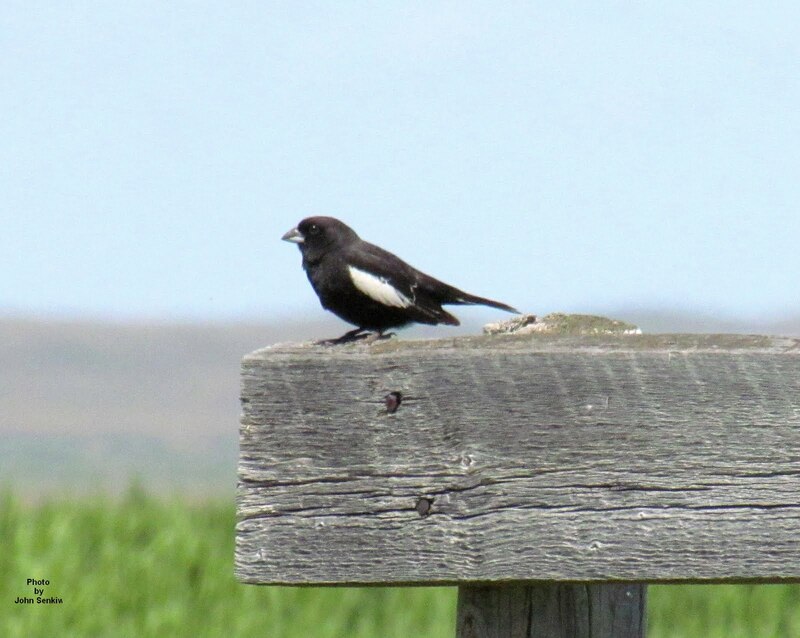 This week's bird, the Lark Bunting, lives almost exclusively in natural grasslands that are more or less undisturbed by human activity save for grazing livestock. They used to be more abundant in areas adjacent to the grasslands but are almost completely absent there at the present. 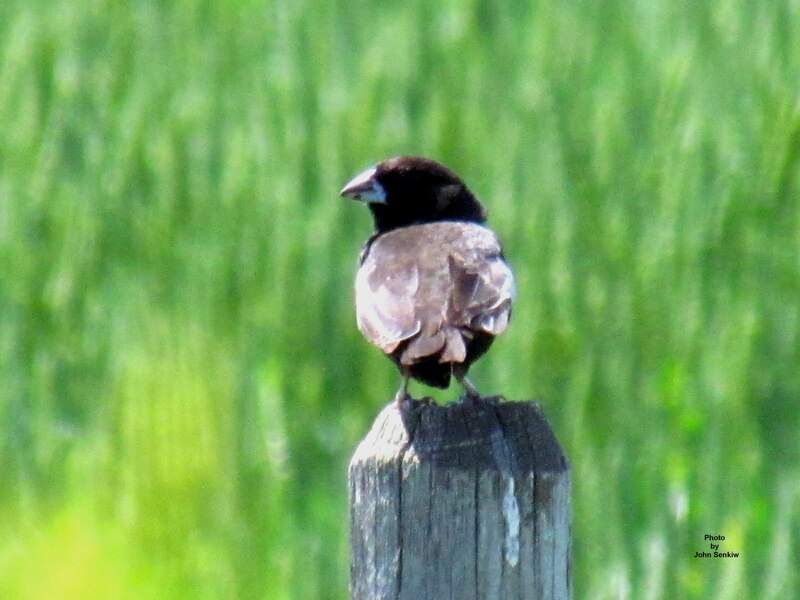 The sparrow-sized male Lark Bunting is easily recognized by its all black body with pure white shoulder patches. 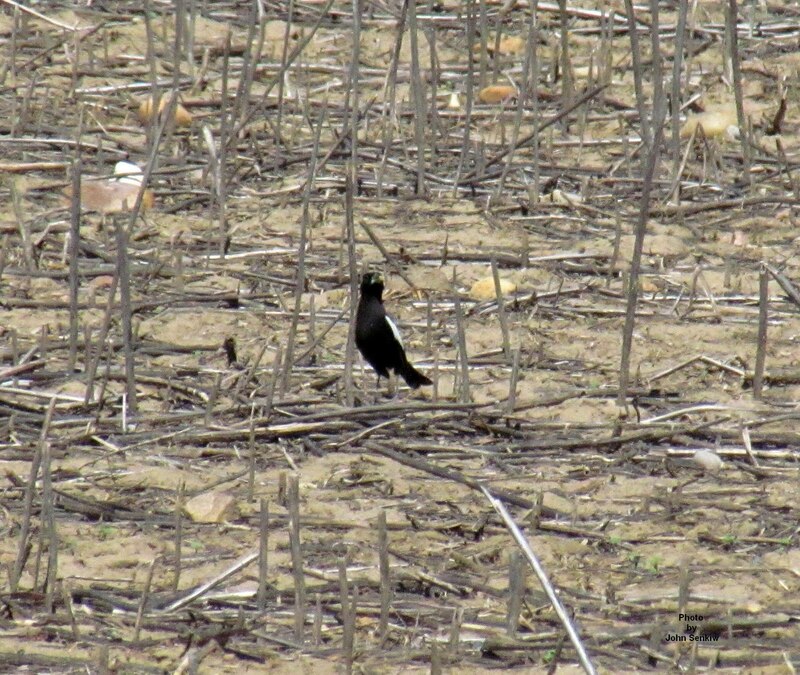 Considering how birds are often named it could have been called the "White Winged Blackbird". In spite of its colours the Lark Bunting is more closely related to the sparrows than the Icterids (blackbirds). 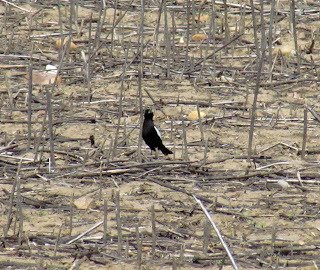 If nothing else its stout triangular bill used for seed eating stands out in sharp contrast to the narrow pointed bill of the insect eating Icterids. The word "lark" is an English term used to describe a family of small birds that flutter slowly through the air usually singing as they do. The European Skylark is probably the most famous one immortalized in poetry such as John McCrea's In Flanders Fields. The Lark Bunting, although not a lark, behaves in typical lark fashion singing a series of tumbling tinkling notes as it flies slowly through the air. Although related to New World sparrows, the Lark Buntings also appears to be distantly related to the visually and behaviourally different New World (Wood) Warblers and share some characteristics of both. Lark Buntings feed and behave like sparrows, however, the males and females are differently coloured like the wood warblers unlike our sparrows where males and females are the same. The use of the term "bunting" is confusing. In Eurasia, the term "buntings" is used to describe birds that are known as sparrows here in the Americas. 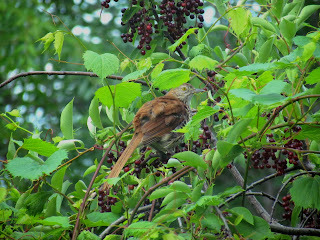 The term, buntings, as used in the Americas really has no scientific meaning and is applied to several different birds related to sparrows. 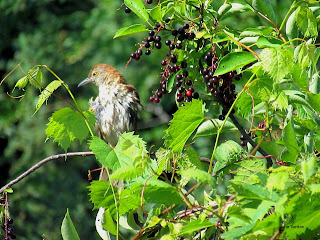 This week's photos were taken along a road near Val Marie . The Lark Buntings were not nearly as abundant as I have seen them in the past but still there were enough of them so that I could get some good pictures. The side shot clearly shows the white shoulder patch while the rear view gives a good profile of its massive beak. Next week - the Ferruginous hawk.